Michael became a hurricane late Monday morning and is expected to intensify rapidly before making landfall on Wednesday. It took 400 miles and fewer than 70 hours to evolve from a Tropical Depression into a category 4 hurricane. There are multiple reasons for this rapid intensification. 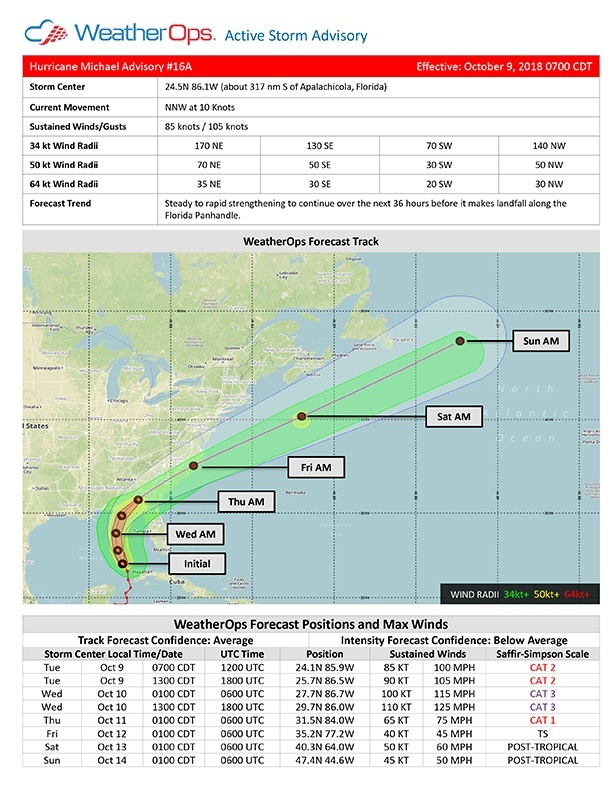 Let's begin by looking at WeatherOps' Forecast Track and Intensity Forecast from the Active Storm Advisory issued Tuesday Morning. The forecast track is essential in that the conditions ahead along the track will govern whether the storm weakens or intensifies. Two factors that can be especially important are water temperatures and wind shear. Both of these can be analyzed with products from Frontier Weather. 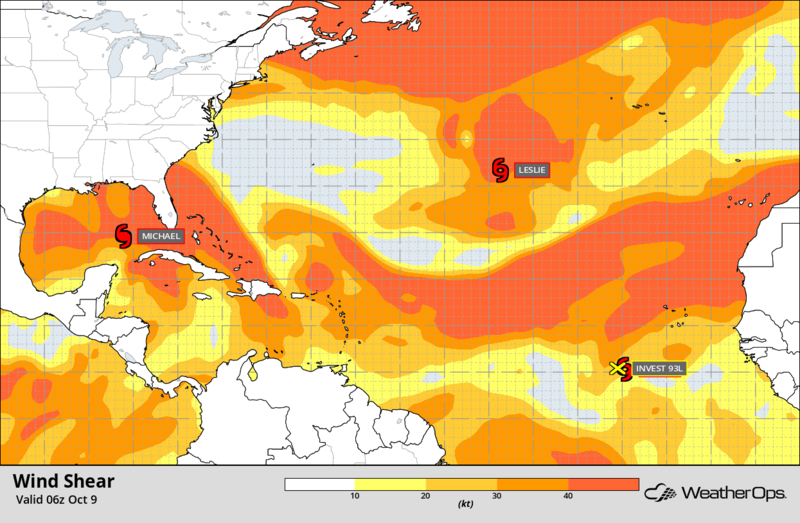 Warm water temperatures, typically warmer than 80°F, act as fuel for a tropical storm or hurricane. The warmer the water temperatures are in the storm's environment, the more latent heat can be released. This release of latent heat is what fuels the storm and allows it to strengthen. Analyzing the forecast track in light of these Sea Surface Temperatures, we can see that Michael is moving into warmer water. These higher temperatures would support further intensification, but strong wind shear can often limit this process. Referencing the map above; environmental shear is relatively constant along much of the forecast track. 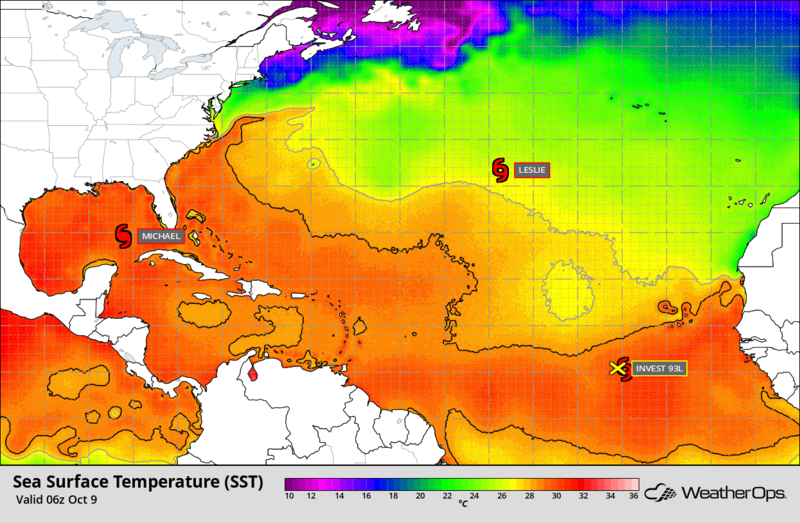 While the shear is modest, the warm water temperatures should allow Michael to continue to intensify rapidly. As the hurricane moves northward, it will enter an environment with weaker shear and will enable Michael to strengthen further. Michael is expected to make landfall in the Florida Panhandle as a category 3 hurricane on Wednesday. 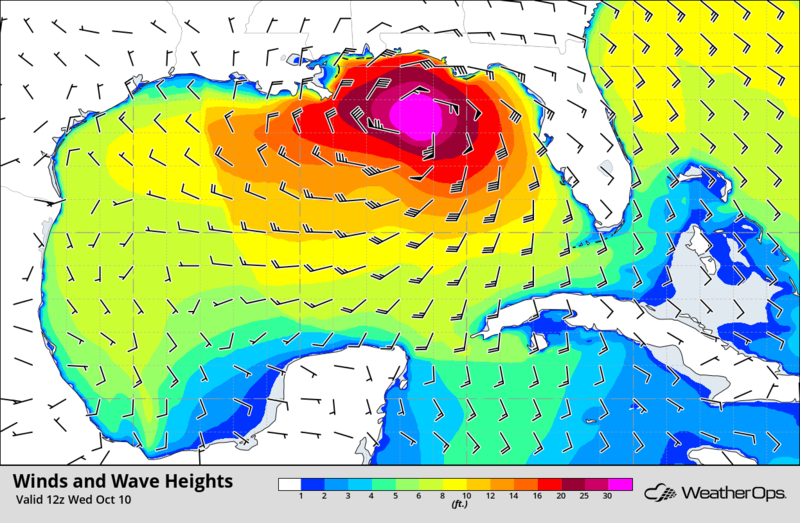 This hurricane will cause wind and wave heights to increase as well. By Wednesday morning, winds along the coast will be near hurricane force, and wave heights just offshore will be more than 30 feet in some locations. No single factor can adequately assess the potential for a storm to intensify. Understanding both the environment that the storm is in currently, and the one that it is moving into can help us understand how a tropical storm or hurricane may evolve.